With the deadline to enter the 2016 NBA Draft quickly approaching, Charles Cooke has announced he will be coming back to Dayton. After senior leader Dyshawn Pierre graduated and the tragic loss of beloved big man Steve McElvene, this comes as a huge relief to Flyer fans. Cooke played his first full season for the Flyers last year after transferring from James Madison. The redshirt junior certainly exceeded the high expectations and helped fill the shoes of Jordan Sibert. Now returning for his senior season, Cooke will be called upon to advance his game even further. Cooke burst onto the scene early last season. In Dayton’s second game he scored 21 points along with 7 rebounds in the Flyer’s dominating win over Alabama. Cooke followed up this performance with continued success throughout the year. He scored in double figures in 25 of Dayton’s games last season and could drop 20 plus on any given night. Cooke not only scored in bunches, he also made his presence felt on defense and the glass. Along with fellow guard Kyle Davis, Cooke was one of Dayton’s top lock down defenders. At 6’5″ he even contributed to rebounding, pulling down an average of 6 boards per game. 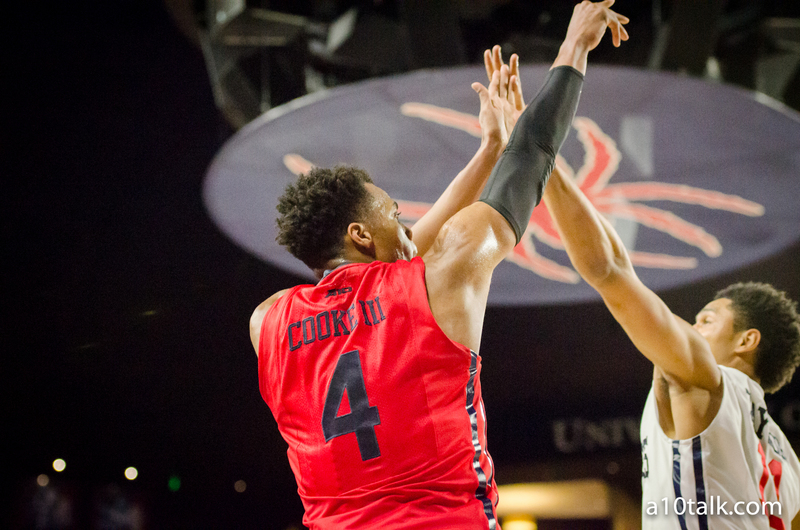 Despite it being just his first year in the conference, Cooke’s numbers earned him a spot on the All A-10 First Team. If Cooke continues to improve in his senior season, he’ll be right in the running to win A-10 Player of the Year. While an award like this would be a great individual accomplishment for Cooke, he’s most focused on chasing success for the team. Dayton made the NCAA tournament for the third straight year last season, but lost in the first round to Syracuse. The previous two seasons the Flyers won multiple tournament games and they will look to go even further than that this year. With Charles Cooke returning for his final season, Dayton seems to be in prime position for another highly successful year.